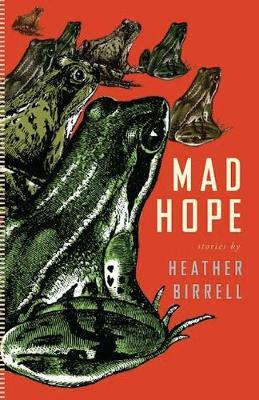 In the stories of Mad Hope, Heather Birrell finds the heart of her characters and lets them lead us into worlds both unrecognizable and alarming. We think we know these people but discover we don't-they are more alive, more real, and more complex than we first imagined. A high school science teacher is forced to re-examine the role he played in Nicolae Ceausescu's Romania after a student makes a shocking request. The uncertainty, anxiety, and anticipation of pregnancy are examined through an online chat group. Parenting is viewed from the perspective of a gay man caring for his friend and her adopted son. A tragic plane crash becomes the basis for a meditation on motherhood and its discontents. Birrell uses precise, inventive language to capture the beautiful mess of being human-and more than lives up to her Journey Prize accolades. Her characters come to greet us, undo us, make us yearn, and make us smile. Heather Birrell is the author of the story collection I know you are but what am I? Her work has been honored with the prestigious Journey Prize for short fiction and the Edna Staebler Award for creative nonfiction.